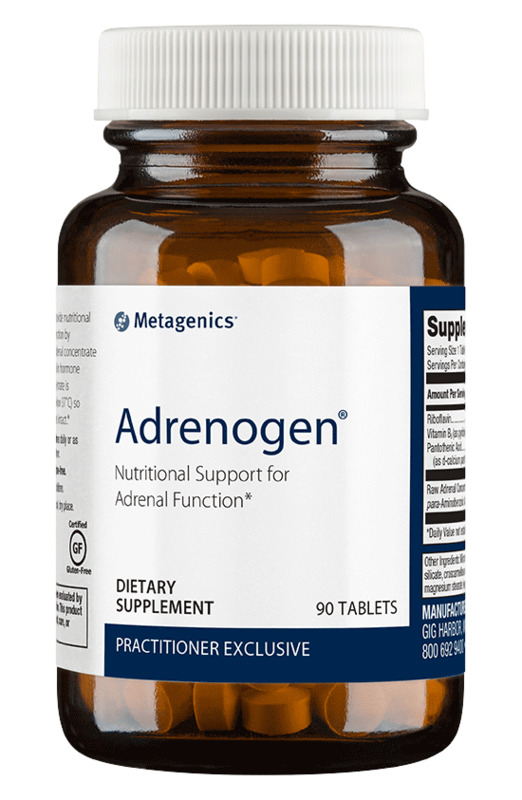 Adrenogen provides nutritional support for adrenal function by combining high-quality nutrients that are involved in hormone regulation. The bodys adrenal glands produce stress hormones, steroid hormones, and blood pressure-regulating hormones. * Delivers a select blend of B vitamins involved in adrenal hormone production. * Provides adrenal concentrate† that is guaranteed raw (processed below 37°C) so the natural constituents remain intact. †All bovine glandulars found in Metagenics products are imported from New Zealand. New Zealand has an active government-monitored BSE (Bovine Spongiform Encephalopathy) surveillance program and no known cases of BSE.